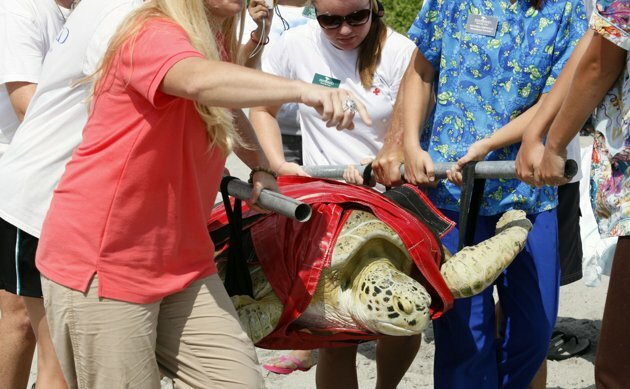 WEST PALM BEACH, Fla. (AP) — Andre, a sea turtle who survived catastrophic injuries and underwent a year of rehabilitation and innovative surgeries, has been found dead, three weeks after he was released off the Florida coast. Loggerhead Marinelife Center, which had cared for the turtle, said he was found Wednesday on Hutchinson Island. David McClymont, the center's president, said staffers were able to identify the turtle from a tag that had been placed on him, but he was in such bad condition they couldn't determine what killed him. "The staff and the entire volunteer base are deeply saddened," he said Thursday. Just three weeks ago, a raucous crowd of hundreds gathered to watch Andre crawl into the sea and swim away. Onlookers hugged, wiped away tears and talked of the inspiration the reptile gave them. Amid the disappointment over the sea turtle's death, his caretakers said the herculean efforts they took to save Andre — including several procedures considered animal firsts — were already helping others. "The scientific advancements we made while rehabilitating Andre are already being applied in the treatment of other threatened and endangered sea turtles," the center said in a statement. When Andre was found stranded on a sandbar on June 15, 2010, he had gaping holes in his shell, the result of two apparent boat strikes. More than three pounds of sand were inside him, along with at least a couple of crabs, a raging infection and a collapsed lung. His spinal cord was exposed, pneumonia was plaguing him and death seemed certain. To help remove fluid and other materials and close his wounds, doctors used a vacuum therapy system. To help close gashes in the shell, a local orthodontist installed braces similar to those used on humans. And to fill in the gaping holes, doctors employed a procedure typically used to help regrow breast tissue in mastectomy patients and abdominal tissue in hernia patients. The turtle's story was followed by many of the 225,000 annual visitors to the center and through a round-the-clock webcam. Children flooded him with mail and checks flowed in from around the world to support his care. At 177 pounds when he was released, Andre was believed to be about 25 years old.